The following links are provided to be of assistance to those look for further information on kayaking & canoeing in Sussex & throughout the UK. 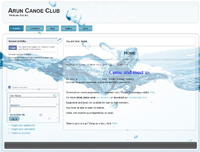 The links on this webpage may let you leave the Brighton Canoes website. The linked sites are not under the control of Brighton Canoes and we are not responsible for their content. The inclusion of any link does not imply endorsement or recommendation of any organisation or website by Brighton Canoes. 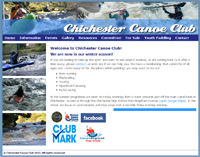 Sussex is lucky to be the home of a number of excellent canoe & kayaks clubs. Canoe clubs are a great place to learn kayaking and canoeing skills as well as being a great place to meet fellow paddlers. The majority of local canoe clubs run the BCU Star Award Schemes and various other training courses throughout the year. In addition to paddling in home waters many of the local canoe clubs organise trips to locations throughout the UK and some even abroad. 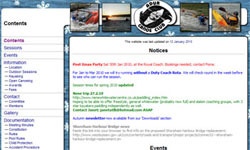 The Adur Canoe Club's main activities are based on the River Adur, Shoreham-by-Sea. The club's main sessions are run on the River Adur most Sunday mornings at 10am throughout the year. During the summer months the club run a Tuesday evening session at 6.45pm. The club operates from April to October and is based on the Chichester Canal Basin. Members have the opportunity to access high quality coaching, trips and paddling in a relaxed social environment. 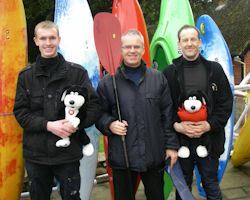 The club in also linked to The Hunston Project aimed at providing kayaking for junior paddlers. The Cuckmere Valley is a beutiful setting for any activity particularly kayaking. The CVCC offers coaching & training for both beginners & experienced kayakers. The club also runs various away trips to other local rivers such as the River Rother & Medway as well as various whitewater rivers further afield. Hastings Canoe Club in situated on the beach on the far west side of St Leonards. The club offers guidance and tuition to newcomers as well as running a number of trips including exotic places such as Uganda! The club also run pools sessions for those looking to learn in a warmer environment. 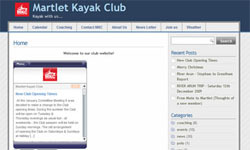 Martlet Kayak Club is a small but lively members Club based in Brighton, which provides facilities, equipment and training to promote and encourage the participation in kayaking and canoeing. The club offers coaching & training as well a running various trips. Phoenix Canoe Club are based at the North Circular Sailing Club on West Harp Reservior in NW London. The club run regular BCU coaching courses and welcome new paddlers. Photo - Members of Phoenix Canoe Club at the River Dart, Devon. Another option for training & tuition in kayaking & canoeing skills is outdoor centres & commercial operators. If clubs really aren't your thing or you are looking for more instant, intensive or specially tailored training then commerical providers could be a good choice. 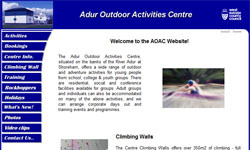 The Adur Outdoor Activities Centre, situated on the banks of the River Adur at Shoreham, offers a wide range of outdoor and adventure activities including Canoeing/Kayaking, Mountain Biking, Indoor & Outdoor Climbing, Raft- Building, Orienteering and much more. 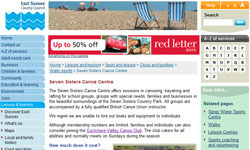 The Seven Sisters Canoe Centre offers sessions in canoeing, kayaking and rafting for school groups, groups with special needs, families and businesses in the beautiful surroundings of the Seven Sisters Country Park. All groups are accompanied by a fully qualified British Canoe Union instructor. The Kayak Coach operates throughout Sussex offering personal and group tuition in kayaking & canoeing. The kayak coach run BCU Star Award courses training & assessment as well as kayak fishing experiences, local river trips and birthday, hen and stag parties. 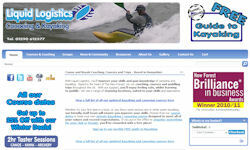 Liquid Logistics are an outdoor activity centre based in the beautiful setting of the New Forest in Hampshire. 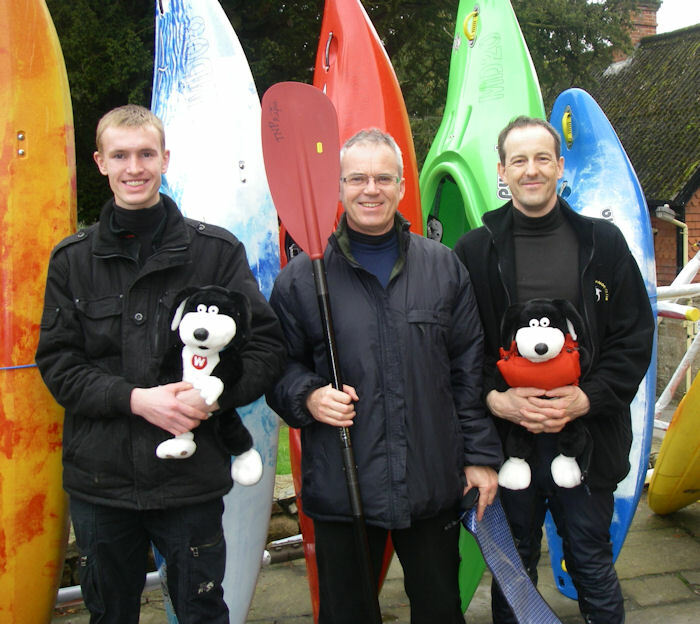 They run a variety of kayak and canoeing courses & trips throughout the UK. They also run a number of non water-based activities such as archery, cycling & more.